Berlin is one of the most active and attractive Tango cities in the world. 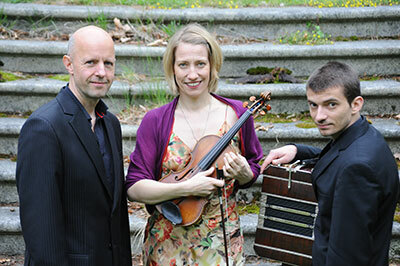 And in this „tango-city“ the brilliant bandoneon player, Michael Dolak, the expressive violinist Cordula Welsch and the highly acclaimed pianist Robert Schmidt founded the Berlin Tango Trio with the intention of developing a fresh, new Tango sound, which reflected their individual background whilst being faithful to the classic scores. Berlin Tango Trio consists of three musicians who can look back to a reach playing experience in tangogroups like “Cuarteto Rotterdam”, „Puro Apronte“, “Gran orquesta Sabor a Tango” and “Tango Real”. All three of these fine musicians are internationally recognised in their field and have played tango in distinguished venues all over the world. Berlin tango trio plays tango from desire and passion. They are maestros of all genres of Tango, from the elegance of the Golden Age to the melancholic drama of Astor Piazzolla. Their interpretations are wonderfully danceable, full of rhythm and expression. Their musicality is so subtle and nuanced that everyone is swept away by the romance and pure joy of their playing.